Monsters can be big or small, tiny or tall – but they can certainly be colorful & fun! 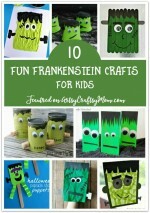 Here are 10 easy & fun monster crafts for kids to make for Halloween! Monsters ‘hind my bedroom door! They’re in the bathroom, too! maybe, even red or blue! Well, that’s true – monsters can be any color, and they can be anywhere – especially considering that it’s Halloween now! These are lines from the poem ‘Help! Monsters!’ by C.J. Heck, which talks about a child’s fear of the unknown – his imagination pretty much takes over! And that’s exactly the best thing about monsters – you can imagine them to be any which way you want them to be. So if you were ever in need of an open-ended craft, a monster craft is your best bet. Even toddlers can create their own monsters, and there’s not going to be any right or wrong way to do it. And you can make monsters out of pretty much anything – cardboard tubes, pipe cleaners, tin cans, boxes and of course, paper! 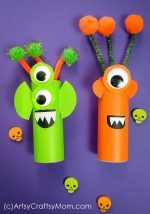 So here is a collection of some cool, colorful and fun monster crafts for kids to make this Halloween, either for themselves or to play with their friends. Most of these require basic craft supplies, but make sure you get the brightest, shiniest stuff – we like our monsters festive! Monsters come in all shapes and sizes, and Easy Peasy and Fun shows us how a cone monster would look like! With a template to download, making the basic cone monster shape is easy peasy, and adding on the details is the fun part! Add wings, eyes, horns – whatever you think will go! Potatoes are awesome – you can have them as jacket potatoes, mashed potatoes, wedges or fries. But did you know that you can also turn them into monsters? Yes, just use a potato to print on paper and with a little effort, you can easily turn it into a cute and colorful little monster! This project from I Heart Crafty Things is a great way to practice an art technique and have fun with the result! Smashing the paint is so much fun that no one will be able to stop at just one monster. So go ahead, make a whole set and put on a monster puppet show! 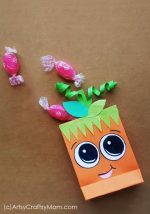 Give your preschooler something to keep him busy this season with these printable monster themed pom pom mats. Use pom poms to place on the circles, match buttons to the colors, or exercise those little fingers by making play dough discs to place on the monster. Much better than any battery operated toy! You’ve been living under a rock if you haven’t seen the recent rise in the number of rock crafts! Crafty Morning goes with the trend by making these cute rock monsters just in time for Halloween. Paint the stones first and once they’re dry, add details. Googly eyes, fangs – whatever rocks your boat! It’s Halloween, which means it’s time for trick o’ treating, which means you need a treat bag! So make one yourself with our free template, and dress it up appropriately with large eyes and teeth which you can make as big or as small as you like! These tin can monsters are honestly among the quirkiest I’ve seen recently! Hello, Wonderful makes good use of old tin cans and felt to create some out-of-this world monsters. The thing I like about this project is that you can use all kinds of materials including fabric, yarn, tissue paper and others to create something unique. 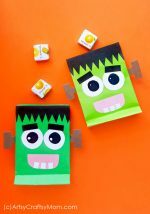 Whether you’re celebrating Halloween at school or you want to get everyone into the Halloween mood, these monster bookmarks should do the trick! 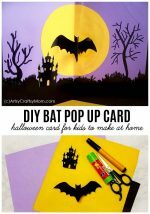 Super easy to make out of paper, you can go for vampires or monster dragons – the choice is entirely yours! Sure you’ve got your Halloween costume all planned out to the last detail, but don’t you think a bland treat bag would look too ‘meh’ with it? Give your costume that finishing touch by going with a treat bag that’s dressed up – in this case, as Frankenstein the monster! Got cardboard rolls lying around? Okay, then this project is practically begging you to use them! Add colored paper, pipe cleaners, pom poms and what not to turn them into the weirdest monsters the world has ever seen. Want a monster with just one eye? Done! Two eyes lying vertically? Go ahead! 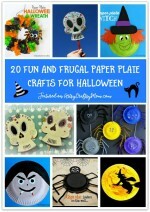 So which one of these fun monster crafts for kids are you going to make this Halloween? Is it going to be a Frankenstein treat bag? Or maybe a silly paint puppet? Whatever it is, I sure hope you enjoy making the monster as much as you enjoy playing with it! then they all just disappear.